The Cats have opened a season 4-0. Coach Calipari's last two teams could not start 4-0. Admittedly his first 3 teams satisfied this early season marker. Neither of Gillispie's teams could manage this, and only three of Tubby Smith's 10 teams managed to post W's in their first 4 outings. Therefore, 4-0 by itself is not a rare UK basketball event, but is noteworthy, and is the rule, not the exception for the Calipari Era. The news is not the 4-0 start, but the manner in which these Wildcats have cruised through those first 4 games. Nearly every pre-season poll and pre-season rating system placed the Cats at the top of their predictions/projections for the 2014-15 season. However, the one that I trust most, Pomeroy, did not do it this year. This start has been sufficient to lift the Cats into Pomeroy's #1 position, ahead of Duke, Louisville, Wisconsin, Arizona, …. the field. That rise is not only justified by the manner that this team has taken apart its first 4 opponents, this start demands the #1 spot. A peak ahead at the remainder of this year's non-conference schedule reveals a level of competition that is more difficult than most seasons. Coach Calipari anticipated the quality of his team, and he scheduled in a manner to keep them challenged. After a tuneup on Sunday against Montana State, the Cats take on UT Arlington, Providence, Texas, and close out the non-conference schedule against North Carolina, UCLA, and at the Yum Center against RickPitino's very strong Louisville Cardinals. Not many holiday cupcakes on that menu. However, the Cats' start has been so strong this season, that the forecast for the non-conference schedule is now 13-0. Montana State is next up, and the mission is much more about seeking perfection in the play and the utilization of this talent via the platoon system than it is about another yawning W.
The Montana State Bobcats are the next opponent to place themselves in front of this continuing buzz saw. The Bobcats enter Rupp Arena tonight with an early season 0-3 record, with a 7-point loss at #177 Cal St. Northridge, a 16 point loss at #250 Grand Canyon, and a 35 point loss at #18 UCLA. Last year, the Bobcats finished 14-17, in 9 th place of the 11 team Big Sky Conference. This season, the Bobcats bring a #330 Pomeroy rating into this game, and their early season schedule strength has been 0.7379 (#73). Montana State has played its first three games at a tempo of 71 possessions, scoring 64.0 ppg (0.904 ppp) and allowing 79.0 ppg (1.113 ppp). The Bobcats turn the ball over on 25.6% of their possessions and force turnovers 17.3% of the time. The Bobcats' get a NCAA D1 average 30.9% of their missed shots back and an impressive 73.1% of their opponents' missed shots. The Bobcats' adjusted NGE as of this morning is -0.155 ppp ( -0.089 ppp for 2014). The Cats will bring their #1 Pomeroy rating through 4 games of with an adjusted NGE of 0.403 ppp. This team is playing at an average pace of 68 possessions per game, scoring 79.3 ppg (1.159 ppp) and allowing 50.5 ppg (0.751 ppp). The Cats turn the ball over on 16.8% of their possessions and force turnovers on 26.4% of opponent possessions. The Cats are grabbing an unheard of 49.3% of their own missed shots, and 70.4% of opponent misses. The Cats are 37 point favorites in Vegas, and Pomeroy sees this game as a 32 point UK advantage. The Adjusted NGE comparison places this as a 46 point UK advantage, 91-45 in a game played at a pace of 69 possessions for Montana State and 70 possessions for the Cats, with a game NGE of 0..64 ppp. The March towards March in Search of Perfection will continue Sunday in Rupp Arena. Coach Calipari continues with the same platoon alignment he used the first three games. If it “ain't” broke, don't fix it. However, Alex Poythress is ill and will miss his second straight game. Dominque Hawkins will start for Platoon 1 in his place again tonight. Platoon 1 consists of Willie Cauley-Stein, Karl-Anthony Towns, Dominque Hawkins, Aaron Harrison, and Andrew Harrison. Platoon 2 consists of Trey Lyles, Dakari Johnson, Marcus Lee, Devin Booker, and Tyler Ulis. Derek Willis, and E. J. Floreal will provide reserve help for either platoon should injury or fouls become an issue during the game. The Cats control the tip, and the force MSU into 7 turnovers on their first 9 possessions, but the Cats find themselves on the short end of a 2-1 score at the under 16 media timeout with 15:37 left in the first half. The Cats start 0-10, 0-6 from long range, and 1-2 from the line. Coach Calipari was so frustrated by the start that he pulled platoon 1 from the floor after only 3 minutes. The second platoon finally got the first basket of the night on a Dakari Johnson layup, and they added 3 free throws to ease on top 6-2, and after a pair of 3 pointers, and a steal for a layup by Devin Booker, the Cats go up by 10, 14-4, prompting a MSU timeout with 11:22 remaining. The first platoon returns to the floor at the timeout. The first platoon was a little more effective than their first appearance. This time, they managed to score 4 points on their 6 possessions, while holding MSU scoreless, but Coach Calipari cut their time short again, pulling them for the second platoon with 8:11 and the Cats up 18-4. The second platoon tacked on a pair of 3 pointers and a layup to move on top 26-7, and Trey Lyles will have 2 free throws after the under 8 media timeout with 6:20 remaining in the first half. Over the remainder of the fourth segment, the Cats' second platoon extend the lead to 32-9 at the under 4 media timeout with Devin Booker set to shoot a pair of free throws after the timeout and with 3:51 remaining in the first half. In the first 16 minutes, the Cats has posted 32 points on 30 possession while holding MSU to only 9 points on 30 possessions. The first platoon will finish the half, with Devin Booker remaining in the game to take his free tosses. Aaron Harrison replaces Devin Booker after he makes them both. The first platoon closes the half with a 39-11 lead at halftime. The Cats lead 39-11 at the half in a game played at a pace of 38 possessions (76 full game tempo). The Cats scored its 39 points on 38 possessions (1.026 ppp) and Montana State scored 11 points on 37 possessions (0.297 ppp). The Cats shot poorly. After missing their first 10 shots, they finished the half 12-32 (37.5%) overall, and only 4-13 (30.8%) from outside the arc. Montana State shot even less effectively, making 4 of 21 (19.0%) inside the arc and 1-9 (11.1%) from outside the arc. From the line, UK made 11-14 (78.6%) while Montana State did not get to the line in the first half. The Cats controlled the Boards, but just barely, 25-20, but Montana State fought on even terms on the offensive glass 7-7 and MSU won the second chance point battle 4-3. Montana State, like Boston University on Friday, has taken away the Cats powerful rebounding advantage of the first 3 games. This game plan is the recipe for beating this team. The Cats managed to get only 35.0% of its misses, while Montana State grabbed 28.0% of its misses. The Cats committed 6 turnover (15.8%) and forced 14Montana State turnovers (37.8%). MSU opens play in the second half, but through the first segment, the cannot get the 11 off the scoreboard, while the Cats add 7 points to their total on 6 possessions to move on top 46-11 at the under 16 media timeout. The first platoon returns to action, and extend the scoreless stretch to the 12:59 mark of the second half with a score of 53-11 at which time MSU takes a timeout. At the under 12 media timeout, the lead has swollen to 47 points, 58-11 with 11:18 remaining in the game. The Cats have scored their 58 points on 51 possessions, and have limited MSU to their 11 points on 50 possessions. MSU has the ball when play resumes. The last points by the Bobcats occurred with 2:42 remaining in the first half. MSU finally ends their drought with 9:36 left. Not only that, but following a UK turnover, a foul sends MSU to the foul line for the first time tonight. In the remainder of the third segment, the Cats continue to roll, 72-17 at the under 8 media timeout with 7:33 remaining and Devin Booker on the line to try to complete his 3 point play that sent the game into the timeout. With 4:35 left, and the Cats on top 82-22, Coach Calipari empties his bench. Each team has had 63 possessions at that point. Cats win 86-28. 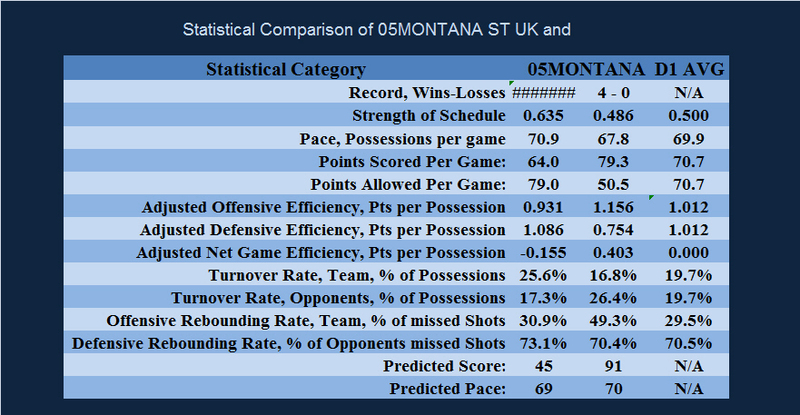 UK scored its 86 points in 70 possessions (1.23 ppp) for the game, and Montana State scored its 28 points on a total of 70 possessions 0.40 ppp). Kentucky won the battle of the boards, with a rebounding edge 53-35, and the Cats won the battle of the offensive glass 18-13. Kentucky used its 18 second chance possessions to score 14 second chance points, winning the second chance points battle 14-8. Montana State had an offensive efficiency of 0.286 ppp on its 70 first chance possessions and 0.615 ppp for its 8 second chance possessions. UK had 1.029ppp on its 70 first chance possessions and 0.778 ppp on its 14 second chance possessions. With respect to the offensive rebounding, UK grabbed a low 45.0% of its misses as offensive rebounds while Montana State was able to convert a strong 27.1% of its misses into bonus possessions with offensive rebounds. UK hit well from the free throw line in this game, making 21-29 [72.4%]. Montana State made 2-2 [100.0%] for the game. Field goal shooting for UK was 29-67 overall [43.3%] and 7-26 from long range [26l%]. For Montana State , their field goal shooting from inside the arc was a low 10-38 [26.3%] and from long range, Montana State hit 2-23 [8.7%]. The Cats committed 8 turnovers, one for every 8.8 possessions. The Cats forced 21 Montana State turnovers, one for every 3.3 possessions. Next Game On Schedule: Tuesday night at 7 pm at Rupp Arena against Texas Arlington.